Only Royal Caribbean offers Tony Award® winning musicals at sea. As an official sponsor of Broadway’s brightest award, we’ve got the shows that you can’t stop singing. See your favorites again or discover great shows you missed. We’ve got your seat for full-scale productions of exciting musicals, including the moving story of CATS, the uplifting Mamma Mia!, the inspiring Hairspray, the killer Queen tunes of West End hit We Will Rock You, and the poodle skirt love story of the Broadway musical smash, Grease. Reservations are required. Slick back your hair and pack your poodle skirts for a larger than life take on Broadway's hit musical, Grease. 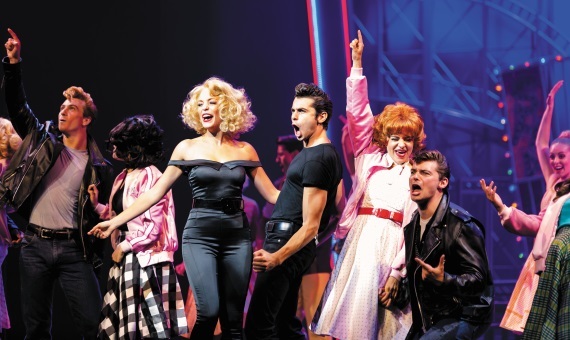 Hand jive and sing along with Danny Zuko, Sandy, Rizzo and rest of Rydell High to classics like Beauty School Dropout, Look at Me, I'm Sandra Dee, and Greased Lightning in one of the most popular shows ever to take the stage. Click here for Harmony of the Seas deals. Click here for Independence of the Seas deals. Favorite felines take the stage as Munkustrap, Mungojerrie, Rum Tum Tugger and the entire Jellicle tribe assemble for the annual Jellicle Ball in the legendary Andrew Lloyd Webber musical, CATS. A winner of multiple Tony Awards, it’s one of the best loved Broadway productions of all time. Click here for Oasis of the Seas deals. Dancing queens, your ship's come in. Broadway's global smash hit for over a decade, Mamma Mia! comes aboard with ABBA classics like Dancing Queen, Super Trouper, Money, Money, Money and Take a Chance on Me in this award-winning musical. Click here for Allure of the Seas deals. Mix big hair, big dreams and all the right moves and you've got one of the biggest Broadway hits of our time - Hairspray. Winner of eight Tony Awards and a record-breaking 11 Laurence Olivier Award nominations, this feel good favorite returns to Royal Caribbean in a brand new, bigger-than-ever production. Break out your bobby socks, because Tracy Turnblad won't stop until she gets her spot at dancing on the Corny Collins Show. But TV stardom is just the beginning. Hairspray is back, and you can't stop the beat! Click here Symphony of the Seas deals. The West End comes to the high seas in Ben Elton's We Will Rock You, the Olivier Award-winning musical phenomenon. Join Galileo, Scaramouche and the Bohemians in an epic standoff against an oppressive establishment, featuring a score of killer Queen anthems, like Bohemian Rhapsody, Killer Queen and of course, We Will Rock You. Click here for Anthem of the Seas deals. Shake things up in Brooklyn with Tony Manero, the king of the disco dance floor. Experience New York City nightlife in its 1970's heyday – complete with platforms and polyester galore. Click here for Liberty of the Seas deals.